Sam sat down at his desk in his new job and began his morning routine. After signing into the computer, he would open up the mail program to see what came in overnight. Then, he would proceed to get into the other programs he needed to do his job. One of the pieces of mail he found in his Inbox that day was a routine announcement from the department’s administrative assistant. She forwarded along to new employees, like Sam, the schedule of days where the company would be closing early in anticipation of a national holiday, where the company would be closed. While it was a rather routine email, it made Sam smile, as he recalled a similar conversation at his old company, but a much different outcome. Several months prior, Sam had a conversation with a fellow employee of his former company. It was a rather routine conversation, skipping from subject to subject. One of those subjects was an innocent comment wondering why the company waited so long to let the employees know that they were being dismissed early on a day before a holiday. Granted, they realized that they didn’t have to be let out early. It was something that the company decided to grant. They did appreciate that. However, for as long as any of them had been with the company, they had always been let out a couple of hours early on a day before a holiday. The issue, if you can call it that, came with the announcement of this early dismissal. Sometimes it would come a couple of days before the holiday. Other times it would come a few hours before the dismissal. Leadership always seemed to keep the employees on edge wondering whether they would be leaving early before a national holiday. Again, while it is a gift from the company, people could not plan to take advantage of that time until it was too late. As it was around the time of a holiday, this topic came up, with Sam wondering why the company seemed so arbitrary in this. His colleague surprised Sam by actually having an answer. It seems, the colleague revealed, that the leadership of the company was dead set against announcing the early dismissals all at once for the year, or even well ahead of time for a very curious reason. That reason? The employees would then be given a new benefit, that of a few extra hours off due to a holiday. The leadership of the company did not want employees to think they were ‘entitled’ to this, decided to make this on a case by case basis, so employees knew it could be taken away at any time. Somehow, that explanation fit the company, but also made him feel a bit like a dog at the table begging for scraps. The leadership was being ‘kind enough’ to give a few extra hours off, and they would never let the employees forget it. As the memory faded away and tucked itself back into his ‘bad old days’ folder, Sam read over the communication from the department’s administrative assistant. There, listed out, were the early dismissal days before national holidays, from that time until the end of the year. 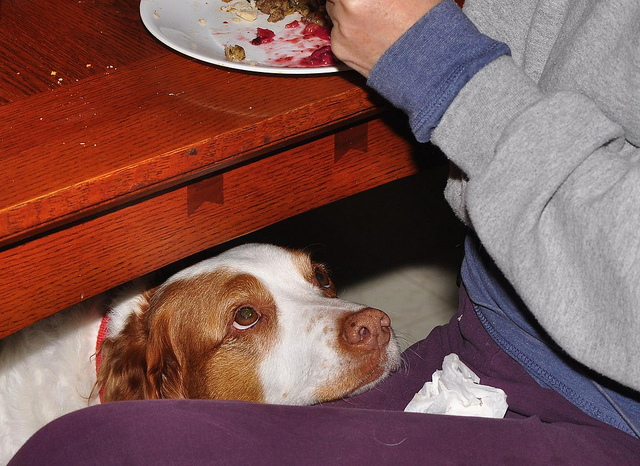 It felt good to be invited to the table instead of begging for scraps. A job description recently went up for a high level position at a company. It was the the leader of the publishing arm of the company. Since the company had many high profile publications, and were facing fierce competition, they wanted to make sure they hired the right person. With the help of HR, they carefully crafted a job description that would encompass all the aspects of the position and the challenges that they would face going forward. Nobody seemed to tell these people that people usually get PhDs so they can be published, not publish someone else’s content. They also didn’t tell them that it might be helpful to have an advanced degree in, oh I don’t know, a publishing related field. This reminded me of a few times in my career where I was told I could not move forward because I didn’t have a certain certification. Now, this certification wasn’t mandatory for any position I was applying for. It wouldn’t replace the experience, the knowledge of the organization, or the subject matter knowledge that I had accumulated. Would it have helped? Yes. Was it a deal breaker in terms of being able to do the job? No. The above two examples, the degree and the certification are nothing more than vanity plates for the department or the organization. They are to be used for bragging rights, not for job performance. They will not help move business forward, get things done, or improve the conditions of anyone. Sadly, the opposite at times happens. The person meets all the vanity qualifications and is horrible at their job. The company or department has focused so hard on getting someone who fills out the vanity that they shortchange whether the person is a good manager, knowledgeable in the field, or has the qualifications that really matter. Everyone suffers then. If they happen to have an impressive piece of paper as well, so much the better. However, let’s put the truly important things first instead of the vanity plates. Sam related that his manager came to him, excited for some new content sent to her by a provider. It was on a flash drive, and as she wanted to give a copy of some of the content to others, she asked Sam what kind of reusable media the department had to copy the items. Sam mentioned to her that they had a stock of flash drives, probably about 25 in number, that had been left over from an old project and were just sitting in the closet. Occasionally he or his co-worker Ralph would use one for some purpose, and it was handy having them there. His manager thanked him and headed off to the supply closet. She returned a few minutes later, dashing into her office, her hands and arms filled with flash drives. Pausing for a moment to process this, Sam walked to the supply closet and was greeted with an empty box where there were, minutes before, 25 flash drives for the department to use. He related that, to this day, not one of the flash drives has reappeared for a business purpose. As soon as the comments about this died down, one of his relatives piped up about something similar in her workplace. Like most offices, her office received little thank you gifts from the vendors they used throughout the year. It may have been a bowl of fruit, some other edibles, or something creative. Usually, before her new manager took over, these were put in a common area for all the employees to enjoy. After the new manager arrived, things went differently. The new manager would take each package and bring it into her office, never to be seen again. Oh, she did say that anyone could come into her office and enjoy the snacks, but she would either stare at the person the whole time they were in there, or the food would mysteriously have disappeared when someone went to avail themselves of something. The manager was always at a loss of where these would go, but was seen many times carrying rather heavy bags out to her car. Being a good manager is made up of many tiny things. Fairly or unfairly, each one of those things are visible to your employees, who will form an opinion of you based on the actions you take. You don’t need to be perfect, but you do have to have a favorable balance in order to gain the respect of your people. When you show that you never learned how to share, you give the impression that you only care about your happiness and well being. Nobody else matters. Your happiness overrides everything. If extrapolated into how you are going to deal with people whose work lives are in your hands, what are they bound to think? They are going to think that you will manage them with the same greed that you have shown in your other actions, thinking nothing of them, but only of yourself. And, if this is how you are going to rule them, they might as well take whatever they can whenever they can. After all, isn’t that what you are modeling to them? If you want a genuinely caring and giving culture, start with yourself. If you only think of you, don’t be surprised when your employees only think of themselves. You could hear the pure joy in Sarah’s words in the email. She was announcing the promotions of three of her managers to higher level manager positions within the organization. Sarah extolled their virtues, recounted their successes, and gave each one of them her heartiest congratulations, and encouraged the staff to do the same. If you looked at the numbers, as much of the non-managerial staff did, you began to notice a recurring pattern in the department. In the past eight years, there had been about twelve promotions of existing managers into higher level managerial positions. In the same eight years, the number of non-managers in the department who had been promoted into the management ranks? One. It wasn’t that the opportunities weren’t there. In that same time period, there had been five openings for a manager within the department. All save for one was filled by an outside candidate. It wasn’t that employees in the department hadn’t applied. In at least two of those instances, staff from the department applied for the positions. What were they told? “We’re not even going to consider you for the job”. Great recruiting tool, huh? In the one time when they did hire internally, an extensive search was conducted externally before management was forced to realized that no one had the skills that the person right in front of them had. What Sarah and her predecessors in the department had done was to make management in the department an exclusive club. The velvet ropes had been put up and a ‘No Staff Allowed’ sign had been hung on them. On the other side of the ropes there were promotions and self-congratulations, all in view of those who knew, no matter how hard they strived, how far they advanced in knowledge or skill, they would not get the chance to pass beyond those velvet ropes. Their colleagues within the company, those colleagues with progressive managers, were moving up the ladder. Sarah’s people knew they could not even step on the first rung. The only chance they would have is to move on to another company. When that day came, Sarah and the group behind the velvet ropes would wonder why they were leaving. They would not worry long. They would console themselves with another round of internal promotions. Author’s Note: This blog is the first in a series regarding development within a department and the role management has to develop their people. While the topic has been covered previously in this blog, a few recent stories have come to me that indicated the subject was ripe for further investigation. It was the third time in as many months that the same phrase was heard. The phrase, “I’m leaving my job” was first uttered by an administrative assistant in the department who went to another part of the company because of a better job offer. The second time was a mid-level employee who was quitting the department and company altogether for a better job offer. The third person had just announced to her supervisor that she was pursuing the former job of the first ‘quitter’ because it offered more money and it would get her on a better track to job improvement. Or, in other words, a better job offer. The third employee’s supervisor sighed and said she understood. She realized it was a small unit within the department with very little chance of upward mobility, though the supervisor herself had managed to get a promotion about a year ago. There would only be movement if there was someone in that unit that left or was dismissed from their position. It was a recipe for a revolving door. Taking a broader view, the department had already lost two employees to someone else, and while the third employee wasn’t looking on leaving the department at present, she was going to leave her current job for the same reason…no chance for advancement. Who knows how many others were looking to leave the department, but had not found the right opportunity yet. Management’s reaction to each one of these real or possible departures? Oh well, we’ll miss you. No exploration of why the person was leaving, no asking them to stay, no negotiation…nothing. Just a wave goodbye and a dab of the eye with a tissue. Even when an employee was bold enough to explain why they were leaving, the reasons were buried in statistics about departures from the company as a whole. Why do people leave a company? There are many reasons, of course. The old adage, “People join companies but leave managers” is a popular and justified one. It could be the company itself doesn’t care about their people and is simply a bad company. It could be that the person is simply restless, even though the company itself is comparatively good to them. It could also be that, once the person is in their job, the company does nothing to keep them there. How could a company and its management do that? Sadly most companies don’t do this, but are more interested in filling a hole, and once it is filled, ignoring the person. As long as the work is getting done, don’t worry about the occupant of the position. They are expendable. You can always find another one of them. So what if it costs upward of $75,000 to onboard a new person in the position. It’s the company’s money, right? The only time job growth seems to come with this short-sighted attitude is when management themselves want to move to the next rung of the ladder. Then it seems to be important. I once had a manager who believed that job growth was the sole province of the employee. What I tried to tell her many times was that without the support of management, that growth will never come. Keeping an employee engaged and wanting to stay in a company is a partnership between the employee and management. Both have to bring something to the process in order for it to work. Good managers realize this and do what they can to encourage growth. Other managers just sit back and use empty words like, ‘it is up to the employee to do everything’. Without that partnership. Without management taking an active role in the development of their people, the employees will take those steps alone. Most of the time, however, those steps will be right out the door. The project was finished, the thank yous said, and it was time to consider how to reward all those who served so well for endless hours worked. They knew they did not want to give a cookie, like in a previous project. The project leader knew that cash was always good, and decided to hand out bonuses. She handed out bonuses just to certain people, those she felt had led the project to its success. Those who worked the late hours, but did not lead a team on the project would not only miss out on any bonus, but those who did get a bonus were sworn to secrecy so those who didn’t would not feel left out. In other words, rewarding people in secret was the buzzword of the day. Unfortunately, we all know how well secrets are kept in corporations. Soon enough, the secret was out, and Emma, who had worked very hard on the project, went into her boss, the project leader, to understand why she wasn’t given a bonus. The answer given was that there wasn’t enough money to give to everyone, so bonuses were only given to the project leads. It sounded reasonable, though unsatisfying to Emma, who knew she would not win this argument. If there wasn’t enough money to go around, what could she do? The argument that there wasn’t enough money to go around lost some of its validity when it was revealed that, thanks to the hard work of all the project participants, the project came in under budget to the tune of $6,000,000. Six million dollars. The project manager mentioned it to show how well she had managed the project. In addition, it was discovered that, contrary to what the project leader claimed, staff other than the leads had received bonuses. The staff who had not received bonuses were left with the feeling that they were lied to in addition to being cheated out of money they could have used. To this, the project manager had no answer. She was more interested in flaunting her prowess in managing the project than to use some of that money to properly thank all her staff, not just those she felt should be rewarded. When you keep secrets from your staff because you rewarded only some of them, you are setting up an environment where you will never be trusted or respected again. More than that, you encourage divisiveness between the haves and the have nots. When you compound that with the fact that there was enough for a reward for everyone, but you opted to fabricate an excuse for why some people could not get the reward, you have pretty much told your staff that your only concern is yourself. When you model that behavior, you cannot expect your employees to want to give their all to the company, act with integrity, or have any trust in your management at all. Your power has gone from influence based on respect to a staff simply doing what they are told for fear of being fired. They fear being fired because you, as a manager, have shown you have no respect for them or their work. One of my favorite sayings is that every decision has its consequences. So this manager could trumpet the savings she had and reward her friends on the project, she disenfranchised scores of employees who may never have the motivation again to put in the hours needed to make future projects successful. See what money you can save, but first and foremost, respect those who labored so hard to make it a success,. It is a long term investment to ensure that when that staff is called upon to give of themselves once again, they do so willingly, because their manager is one who cares as much about them as he or she does about the project.